Introducing your tot to finger foods is easy–and important for her growth and development. 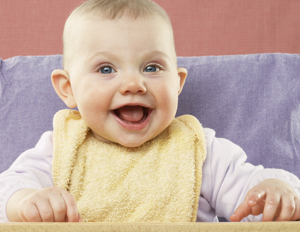 Here’s what (and what not) to set out on her high-chair tray. Give these yummy finger-food options a try. Cut peeled soft fruits (banana, peach, pear, kiwi, watermelon, mango, cantaloupe) into tiny pieces. Cook firm fruit like apples until they are softened. Grapes and pitted cherries are good too, but they should be cut in quarters to prevent choking. Canned peaches and pears in juice can be rinsed (to remove some of the extra sugars) and blotted dry (to make them easier for the baby to grasp). You can roll fruit in wheat germ for extra nutrition. Cook and cut up vegetables, such as broccoli, cauliflower, sweet potatoes, squash, carrots, green beans and spinach. Steam veggies a bit longer than you normally would so they’re fairly soft for a baby who is just getting used to solids and doesn’t have many teeth. You can also finely grate raw carrot or cut soft, ripe avocado into small pieces. Try cooked egg yolks, cooked firm tofu, ground beef, chicken or turkey, and small cubes of chicken, lamb or pork. As your baby gets older, larger chunks of food will be appropriate. Regardless of what babies are eating, they should be supervised at all times.